If you were to walk into my house at this very moment, you’d find yourself awash in lots of clutter. Piles of our 4-year-old’s artwork and my to-be-filed mail. Two (yes two) rolled-up rugs that will find a place to live in our basement when we get it painted and cleaned for the kiddos as a playroom. Toys…toys…and more toys. Baskets full of clothes (and even piles of clothes near our kids’ overflowing rooms). Oh, and a wayward cat or two napping. The cats are fine. The rest? Not s’much. So, I currently consider myself far from a minimalist individual. 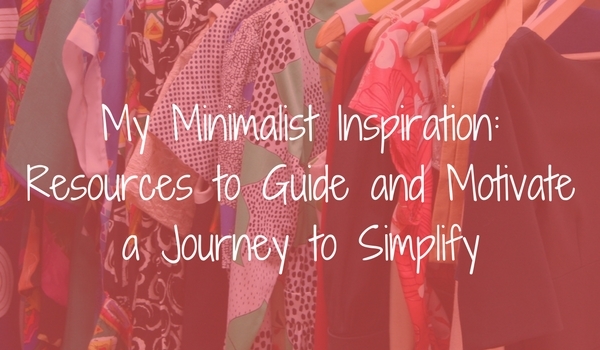 Does that mean that I don’t WANT to live a more minimal, simplified lifestyle? Well, no. Rather the opposite, actually. When I originally wrote this post, all of my mental energy was being put towards packing up my library at school and finishing inventory. Well, and still wrapping my head around the curve ball change we’ll be facing come fall (I’m being moved to the high school library which means our son will be heading to a different elementary school), if I’m honest. As of this moment, though, I’m able to decompress and allow myself to finally looking forward to some relaxation and fun with the family this summer – as I think we ALL need it. Today I’m sharing a few of my favorite resources that help me find the mental energy (which is even more important than the physical sometimes, isn’t it??) I need to start this journey. Pick Up Limes – A good intro to both minimalism and this YouTube channel would be to check out the Beginner’s Guide to Minimalism and 10 Questions to Ask Yourself. Between her positive, soothing persona and realistic tips, I could watch and rewatch her videos a zillion times. Not kidding! One of my favorite things about Sadia’s tips and conversations is that they’re not negative. They don’t really touch upon the whole “Americans consume too much!” complaint. No, she addresses instead how you – not your family, your partner, your kids, but YOU – can make your own changes to better your own life in this way. So. Positive. My favorite. Naturally Thrifty Mom – This is a YouTuber whom I find to be honest and inspirational – she’s endlessly patient as a mom and shares SO much of her life. I just don’t know how she does it sometimes, y’know? While she’s trying to cut back on both her family’s clutter and reliance on packaging, she keeps it real and still buys “normal stuff” (if by normal you consider vegan and organic snacks normal – which I kind of do when they’re, like, alternatives to goldfish crackers and that sort of thing). KonMarie – I’ve had this book for awhile and it’s honestly caused me both inspiration and some consternation. While the author believes that one must essentially surrender 100% to the suggestions in her books, I’ve learned to take the things that totally ring a bell in my brain and make me nod in agreement and kinda leave the rest. I dunno, maybe it’s why I haven’t been able to do a full-on decluttering; maybe she’s right. But so far the main idea I’ve gleaned and brought with me is the idea that the only items we should hold onto are ones that serve a purpose or “spark joy.” Totally legit. And I also remind myself that this is actually a book that has been translated, so the tone is one of an entirely different culture. Always good to recognize and acknowledge. Exploring Alternatives – Seriously, with high-quality videos like this on YouTube, who needs a TV anymore? While my family and I don’t strive to give up 90% of our worldly possessions and travel, living a life of minimalism, the couple behind this channel (and the folks they meet) are truly inspirational. That’s one of the things I love about inspiration. We can take what we want out of it. This channel provides just that. Bea Johnson’s Zero Waste Home – I chatted about Bea’s lifestyle several years ago here on the blog, but find myself still completely in awe over what she’s done with her family. Again, while I’m not about the “extreme” side of this lifestyle, there’s tons of inspiration (and lessons) to gather from Johnson’s choices. Becoming Minimalist really discusses all aspects of the minimalist movement, as it were, with everything from the grand concept of the thing (including an entire mindset shift) down to small tips to simplify your life and consume less. There’s quite literally something for everyone. So, here’s the thing. I hate to create a numbered to-do list for myself because when I force myself to clean something (and find myself lacking motivation), the job is 10x more of a chore. However, a bit of mental organization and a general guideline is good for accountability and I can pick and choose when motivation strikes in that certain area. – Go through (and purge) the basement moving boxes. We moved in November. There are still tons of boxes in the basement we haven’t really found necessary…which tells us they may not be something we need to have, y’know? – Cut back on toys. I’d like to determine a percentage of toys to get rid of (since the kids don’t use a huge amount of them). Not sure I could get rid of ALL of the toys like some parents, although the concept is admirable. But there’s clearly a couple of big issues bubbling with our toy situation, so beyond a purge, an entire mindset shift will be needed. Fingers crossed, folks! – Konmarie my clothes. While I may not use this process for every single item in the house, I do want to start with my own clothes. It’s tough being pregnant and wanting to keep things for post pregnancy (and “normal” me), but clothing is a glut of an issue in our house. And who knows? Maybe it’ll be the inspiration I need to Konmarie ALL our stuff! Oh, and we’re planning on having a garage sale so anything we think folks will find a use for will go to that (or a local thrift store). So finding the balance between wastefulness (and hurting the earth!) and actually doing away with what we don’t need is a challenge, but there are a few ways to do just that. How about you guys? Is anyone else looking to pare back and minimize a bit of their stuff (and life)? I’ve read so much that says that the less things we own, the more clarity we have, so I’m really hoping this is true! Drop me a line if you’ve had any success with decluttering/minimalism in general and how you’ve stuck to it!